You’re down to two candidates. Candidate #1 is a master of the trade. Perhaps a skilled developer or a crafty salesperson with an incredible record. But, they’re clearly only interested in financial windfalls and working on their own terms. Before they’re even offered the job, Candidate #1 wants the corner office with the big window and reserved parking space. Oh, and they'd prefer “senior” in their title too. Candidate #2 isn’t as skilled. Their track record is thin, and their abilities aren’t as solid. But this candidate is excited about the organization and has taken the time to learn about your core philosophies. They know how you serve customers. They crave the opportunity and are ready to jump in. Which one do you go with? The Superstar with or the Eager Underachiever? The bigger question is, how much does company culture matter? Culture is priceless and must be preserved at all costs. If you have a hard-charging, “kill or be killed” culture, then go for the Superstar and watch them rise to the top of the pride. They’ll fit in (or get devoured like a tasty gazelle). But if your culture is built around cooperation and customer focus, then you have to go with candidate #2. It doesn’t mean it’s a lesser hire, or that you’re settling for the more affordable employee. You can’t afford the damage Candidate #1 will do to your culture, after all. Candidate #2 will thrive in time. You’ll build their abilities and set expectations for excellence. Over time, they’ll do far more for the company (and themselves) than Candidate #1. It’s your culture, and your culture works. Employees want to stick in it, and customers recognize it. Even the people on the bottom take pride in their work because they understand their needs will be met. They'll see rewards for their personal investment. Ability is malleable. Finding someone who is a cultural fit is much more significant. But you can’t just hire nice people and hope they’ll somehow become contributors. Few employees are self-motivated to the point where they’ll go above and beyond driven by their own ambition and pride. There have to be systems in place to actually develop their professional abilities. No company every thrived by hiring untalented nice people, after all. Build training into your employee benefits. Help employees identify strengths and how those apply on an everyday basis. Try a mentoring program that exposes new hires to other aspects of the company. Create a clear lifetime career path that any employee can follow. Give them all the employee perks and compensation they need to stay active and engaged. With these elements you’ll build superstar ability, and have the team player underneath. Positive cultures and opportunities aren’t just a touchy-feely concept that’s going to go away. The next wave of employees craves this type of workplace. Candidate #2 is actually representative of many Millennials. 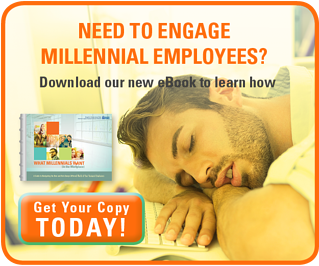 In the research for our Millennials in the Workplace eBook, we found the generation craves growth. Yes, they’d like to be your CEO, but they also rank learning and development opportunities as important aspects of a workplace. It’s also important to them that they enjoy work and coworkers, and can feel comfortable being themselves at the office. Their idea of work/life balance is that work should feel like life. They’re already the largest generation in the workforce, and many of them aren’t even out of college yet. But don’t fall prey to the common objections about “entitlement” and “Millennials are spoiled.” They’re actually putting in long hours and are willing to fail. They want big bucks, but most of them recognize that being kind is a better path to success than being a monster. Chances are if you care about your company’s culture, that culture is something different than most businesses. It’s built around relationships and customers. Your culture is an environment in which people can be free from the BS that plagues so many other offices, leaving them to create their best work. Cultures like yours are a delicate balance, and they require a strict adherence to a certain personality type. Finding candidates who fit that personality is critical. You can’t afford to mess with that culture by bringing in an outlier. That’s why smart companies with cultures that people want to be a part of hire for temperament and develop ability along the way. Because doing it the other way around just doesn’t work.